Last week we went on a few winter hikes. 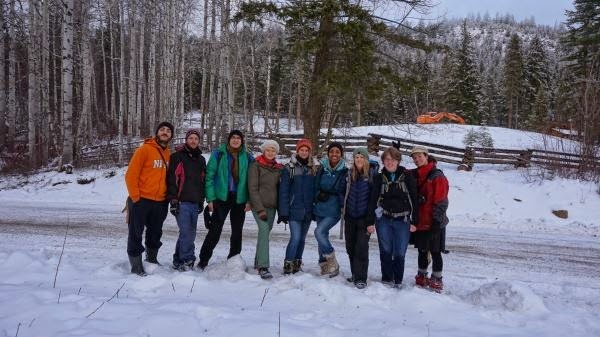 One of the winter hikes was to Pearson Pond to show our new ESL students and interns the area. Though I have been there before, I happily joined the group as I like to see how much places can change with the seasons and sometimes even within a few weeks. I was not disappointed, the forest floor was still covered with soft snow and keen to be the first to take in the changed scenery behind each bend of the trail I had the honour of being the first one to leave my footprints in the snow. It was a beautiful white wonderland, just as you would read it described in a book. Winter hikes let you see the places you knew in a new magical way. Pearson Pond itself was stunning, while I had not expected the scenery to surpass the scene of frozen shores and trees still covered in frost that had enchanted me on my last hike here, I found myself just as entrapped by the completely frozen lake, the snow topped trees surrounding it and the icy peaks in the distance overlooking the scene. While we walked over the solid lake, the children in us came out, one by one, as we slid over the ice and wrote messages for our friends and families on it. The highlight though was the majestic Bald Eagle that was watching us from the top of a tree. 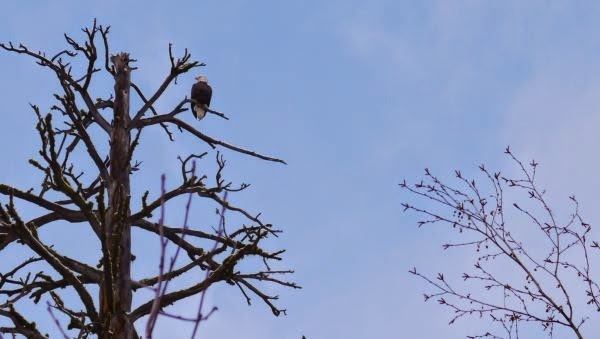 For most of us it was a first time experience to see a bald eagle and from such a close distance, too! I'm looking forward to hearing about your winter hikes!